Rudyard Kipling (1865-1936) was born in India and grew up to chronicle the British Empire. Illustrations by his father, John Lockwood Kipling (1837-1911), feature in early editions of Kipling’s most famous works, the two Jungle Books (1894-1895) and Kim (1901). Rudyard’s father was not the only influential artist in the family: his maternal uncles were the well-known Pre-Raphaelite painter Edward Burne-Jones (1833-1898); and the Royal Academician Edward Poynter (1836-1919). 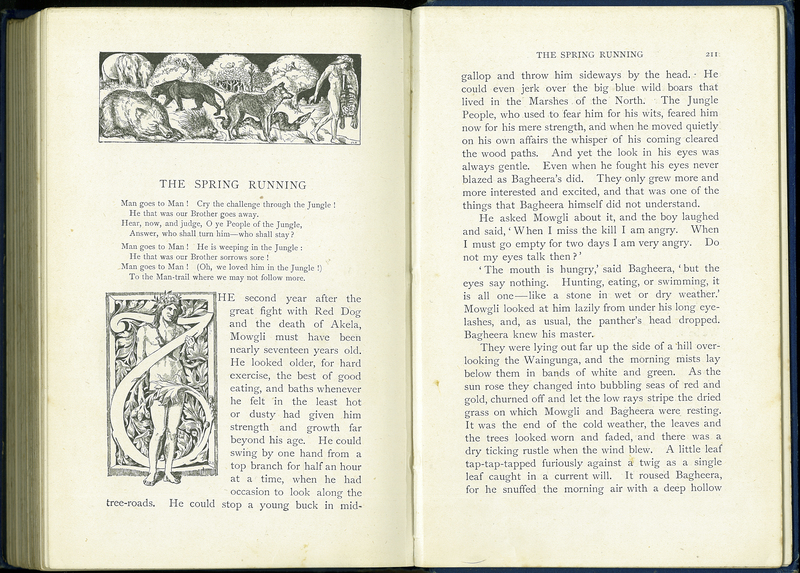 Rudyard Kipling, “The Second Jungle Book,” ourheritage.ac.nz | OUR Heritage, accessed April 26, 2019, http://ourheritage.ac.nz/items/show/10212.